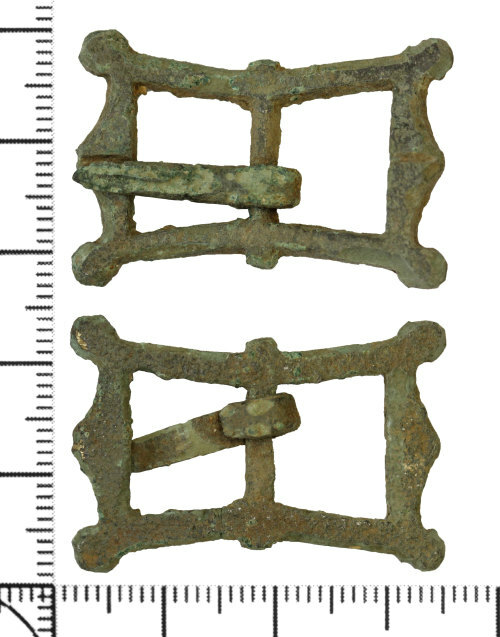 A complete copper alloy trapezoidal double-looped buckle with an integral centre bar and a separately applied pin. The frame is rectangular with pointed projections at the centre of each of the short outer edges, each with a transverse central groove.. The corners have expanded, rounded knops and there is a rounded knop at either end of the centre bar. The apertures are trapezoidal. The frame is undecorated and rectangular in cross section.The centre bar is narrowed from the frame and trapezoidal in cross section, The rear face is flat and undecorated. The pin is tapering with the wide end hooked around the bar. It is trapezoidal in cross section. There are several areas of green corrosion and concretion on the surfaces.